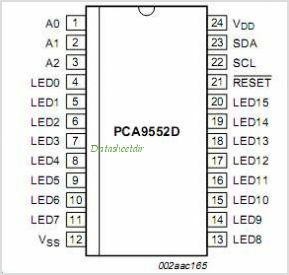 The PCA9552 LED blinker blinks LEDs in I2C-bus and SMBus applications where it is necessary to limit bus traffic or free up the I2C-bus master's (MCU, MPU, DSP chip set, etc.) Timer The uniqueness of this device is the internal Oscillator with two programmable blink rates. 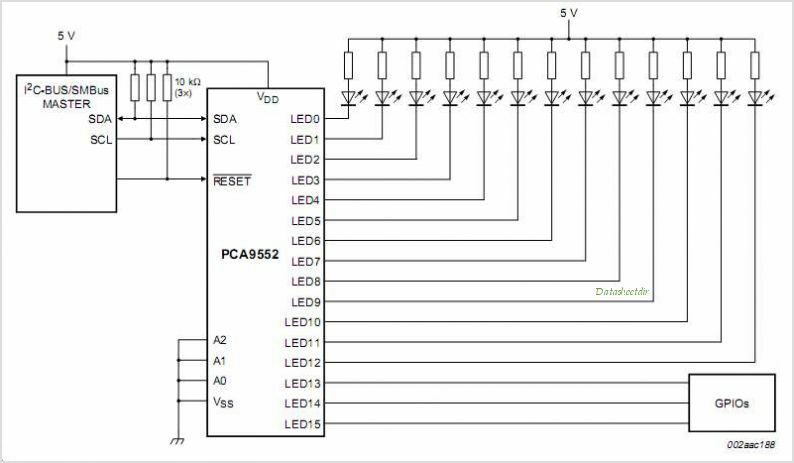 To blink LEDs using normal I/O expanders like the PCF8574 or PCA9554 the bus master must send repeated commands to turn the LED on and off. This greatly increases the amount of traffic on the I2C-bus and uses up one of the master's Timers The PCA9552 LED blinker instead requires only the initial setup command to program BLINK RATE 1 and BLINK RATE 2 (that is, the frequency and duty cycle) for each individual output. From then on, only one command from the bus master is required to turn each individual open-drain output on, off, or to cycle at BLINK RATE 1 or BLINK RATE 2. Maximum output sink current is 25 mA per bit and 200 mA per package. Any bits not used for controlling the LEDs CAN be used for General Purpose Parallel Input/Output (GPIO) expansion. The active LOW hardware reset pin (RESET) and Power-On Reset (POR) initializes the Registers to their default state, all zeroes, causing the bits to be set HIGH (LED off). Three hardware address pins on the PCA9552 allow eight devices to operate on the same bus. This is one package pinout of PCA9552,If you need more pinouts please download PCA9552's pdf datasheet. This is one application circuit of PCA9552,If you need more circuits,please download PCA9552's pdf datasheet.